Here are 3 boys, posing outside the Mayfair Hotel. Does anyone know where it was? Or, is the hotel still there today? The donor of this photograph is just as stumped as we are…….maybe someone out there could tell us more! Trying to make a guess here. Could it be at Jalan Bendahara? Opposite this hotel is Sri Maju Express Bus station and further down from this is Shen Jai High School. This hotel was later taken over by a restaurant.Not sure when.Correct me if I am wrong. we’re not sure ourselves, Ipohgal. but it’s a good start. you could be right. would you happen to know the name of the restaurant that took over the hotel? This is where the current Fair Park Hotel is. The hotel mentioned by ipohgal was Park Hotel. ST archives mention a Mayfair Hotel on Cowan street, after a hand grenade was thrown into the kitchen injuring one. I am now totally confused as I have just read another claim that the Mayfair hotel was where Foh San is today! You are welcome Ken, we always enjoy your memories while you also clear up our confusion. Thanks again. Thank you Ken and I stand corrected…although my father still insists that he was right about it being in Fair Park, haha. As far as I was told yesterday, there was an earlier hotel on the site of the Fair Park Hotel which a number of people agree was called the Mayfair for a while, but it was not a bungalow style building like this one. Could have been the Fair Park under another name? If you did not throw the receipt away, is there any possibility of us having a scan of it please. glad you’ve been ‘converted’ Mano! 😉 indeed, we ourselves at Ipohworld are grateful to Ken Chan and his ‘crystal ball’…. Katherine, Ken…any idea what’s become of these hawkers? have they moved away to another food-haunt? or, have they sadly faded away with time? The Nyonya Laksa Lady looked to be in her 50’s or 60’s during the sixties. Sharing the same place was also a Kuay Teow Chicken Stall, that used real big prawns for making the soup, hence the red colour oil, not red palm oil they use nowadays for show only. One of his sons now operates the Chickin Tauge Shop further down and on the opposite side of Cowan Street. Anybody remember Ipoh Emporium, it was located somewhere in this locality in the sixties and seventies? Ken, your description of the location of Mayfair Hotel jogged my memory of the hotel. I now remember that building, having been there for supper once in 1966. 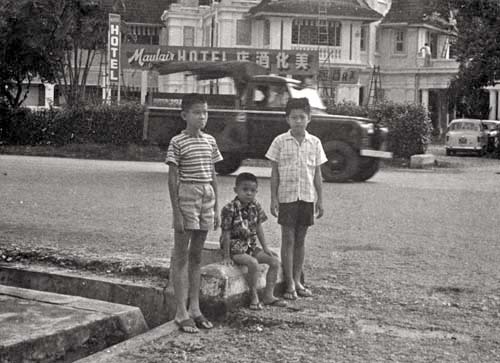 The development of that section of Ipoh, the Excelsior Hotel and its vicinity was fairly recent. It began round about from the mid-70s. Hi Ken, I can’t claim to be a foodie, cos I always go back to the stalls that I like. Rather boring! However, my late father was someone, you could say “lived to eat”. So much so that he started his own restaurant called “Shangri-La Restoran” at 57-59 Cowan Street in the 70’s. I, myself didn’t know it well, as I was away in England at the time and it shut down in ’76 when my Dad passed away. Have you been there before?